equally green in Belgium but written with one 's' . but Veronica asked us to take a closer look. please do visit dear Veronica's place for more. This is so creative! I love your drawings and I reckon so many feelings in me when I see the different situations. And your two grass ladies are gorgeous! your drawings are great! "sie hören das gras wachsen" and the trouble with the moles, ha ha!! and now I'll seed some grass for a new springtime hat!! how fun that you and i thought similar. 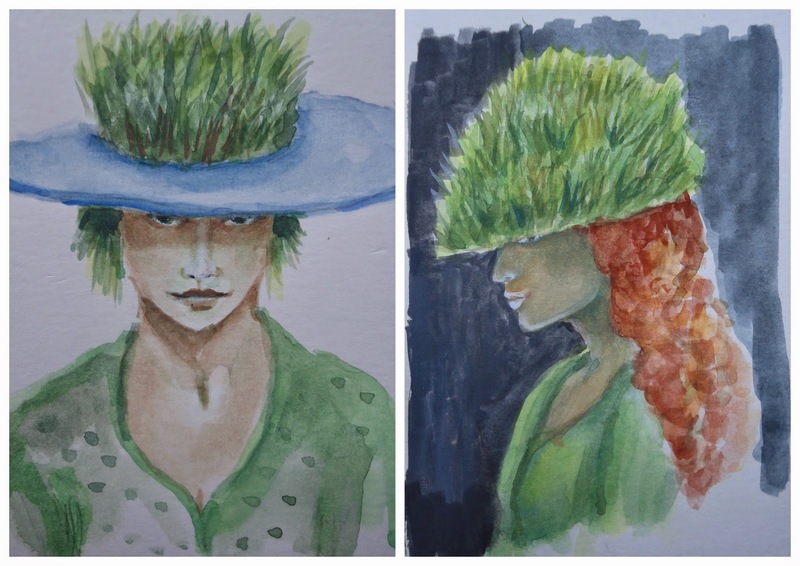 grass this grass that, grass hat. your glass vases and owl are lovely and fun with their grass. and yes bamboo is a grass, i forgot that. and i agree with Viola, your women are gorgeous and something about me begs to take another look. Your frustrating little mole hills made me laugh. I can laugh because there are no mole hills popping up in our grass! Nice post and drawings. Your grass ladies are wonderful. even I take grass for granted. But I know it isn't, despite that it is an old plant, is strong (as you said, bamboo is a grass, too) it grows nearly overall, but when you want a large lawn... huh. Your grass ladies are elfin as Spring! and how it was on your mind...! those sketches are so dear, i love drawn memories and diaries more and more, telling us so much of an instant otherwise easily fled. your two ladies are up for it too. i am so guided by the shadow falling over the first one's eyes. so playful, renilde!